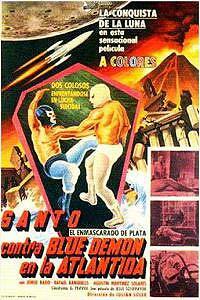 Santo contra Blue Demon en la Atlántida (1970) - Sci-fi-central.com. Mexico  1970  85m   Directed by: Julián Soler.  Starring: Santo, Blue Demon, Jorge Rado, Agustín Martínez Solares, Rafael Banquells, Magda Giner, Silvia Pasquel, Marcelo Villamil, Rosa Maria Pineiro, Carlos Suárez, Juan Garza, Hector Guzman, Griselda Mejía.  Music by: Gustavo César Carrión. A Nazi scientist who has discovered the secret of eternal youth, creates an evil duplicate of the wrestler Blue Demon to help him rule the world from his secret headquarters in Atlantis. 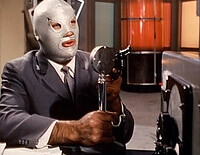 Santo attempts to thwart the villain's plans. Blue Demon (Alejandro Munoz) was already a popular wrestler and ring rival of El Santo, by the time he was drafted into the Mexican lucha film genre. By the time this entry into the Blue Demon series was lensed, the Demon had appeared in 13 other wrestler hero titles. 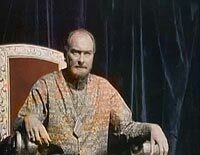 ATLANTIS was made during the heyday of the lucha film -- the late 1960s where color photography and exotic enemies and locales were the new standard for these films. Equally importantly, it was one of several films (beginning with THE SATANIC POWER) to team Santo and Blue Demon as allies against evil. The film begins with footage cobbled together from the Japanese film INVASION OF ASTRO MONSTER (aka MONSTER ZERO) and a couple of other fantasy films. A mysterious power broadcasting from the hidden ruins of lost Atlantis is threatening the world with an atomic attack from space. Investing in a little legwork, the authorities have connected this new foe, Achilles, with a WWII Nazi scientist who had worked on the theories of perfecting a master race. It seems that Achilles (who looks to be in his 40s) and this scientist, who had vanished decades before, may be one and the same. Now, "Achilles" threatens the world with destruction if it doesn't agree to his rule and the installation of this uber-race as the new overlords. The one hope of defeating this madman is a second researcher who knows enough about the Nazi scientist's plans to nullify them. Santo, both a wrestler and an agent in this entry, is already working with the scientist -- though he's never yet met the man. They agree to meet at an upcoming match between the Man In The Silver Mask and Blue Demon. During the match, Achilles' men swap both wrestlers' water bottles for new ones containing a drug. The idea being to capture one or the other and make use of their power and skills. Santo waves his bottle aside, but the Demon drinks the drug and collapses. 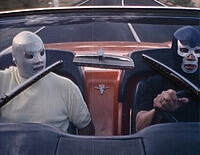 The agents kidnap the unconscious wrestler in an ambulance and Santo "borrows" a car and races in pursuit. When he crashes on a hairpin curve, the enemy escapes. They take the Demon to Atlantis (evidently under a large rock some yards from the cost), where he fights one of Achilles' men. Impressed at the Demon's skill, Achilles offers him a place in his master plan. The Demon naturally refuses and is promptly placed under total hypnotic control. After eliminating a double agent, Santo gets a call from the Demon. They drive out into the countryside, where the hypnotized Demon attacks Santo. A blonde female agent kills one of Achilles' agents, but the Demon escapes. After a duel of helicopters, the Demon parachutes to safety. Santo is captured and hypnotized. He's sent after the good scientist. 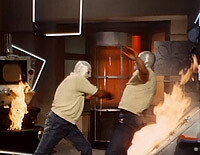 In a surprise twist, as this "Santo" wrecks the lab, another appears and kills the first. 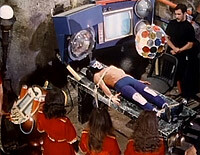 Santo had been saved from being hypnotized, and had arrived to save the researcher. The Demon, showing up at the lab, is captured and deprogrammed with a strobe gun. 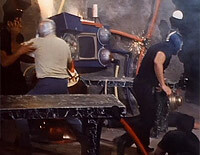 He and Santo, working with one of Achilles' agents, who's switched sides, go to plant explosives in the Atlantis base. At the same time, Achilles is readying his missiles. Captured, Santo is confronted by the blonde agent, who is in reality one of Achilles' minions. A fight breaks out, during which the Demon saves Santo's life. During the skirmish, Achilles is killed and instantly ages. He had succeeded in finding the secret of eternal youth. The turncoat agent is also killed and ages as well. Santo and the Demon escape as the enemy base is blown to atoms. Overall, it's an enjoyable spy romp, though there are a few slight slips. Most notably the scene in which the Demon is driving Santo along a coastal highway, and the shadow of the camera mounted on the back of their red Thunderbird periodically sways into the shot. Review by kikaidar from the Internet Movie Database.